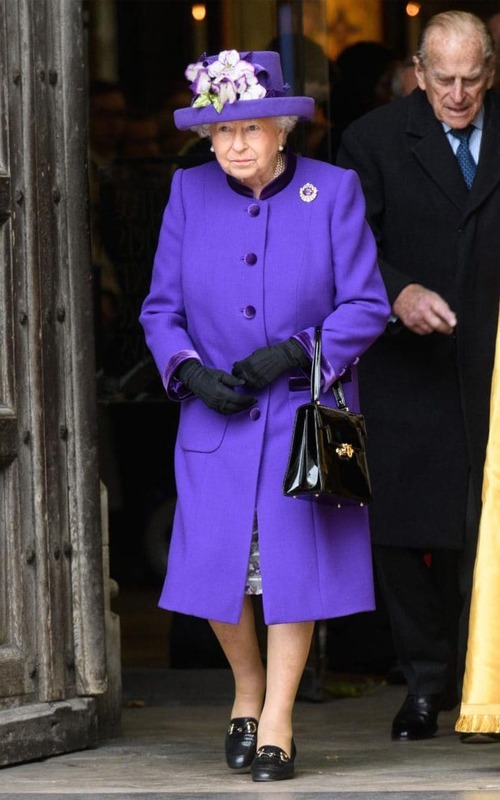 Today, the Queen stepped out in an all-purple ensemble to attend a Thanksgiving service that also marked 60 years of the Duke of Edinburgh Award. Her particular shade of purple (shall we call it Cadbury?) packed a punch when set against Westminster Abbey’s grey stonework, but also stood next to the Dean of Westminster in his contrasting golden cloak. But, of course, she knew it would. The Queen has 63 years of experience in using colour to stand out. Indeed, when she marked the start of her 90th birthday celebrations earlier this year, the Queen kicked things off in top-to-toe fuchsia. Created by Angela Kelly, who has been the Queen’s personal dresser since 1994, the outfit would have been painstakingly planned. Likewise, opinion dividing the neon green dress coat and matching hat which she wore for the Trooping of the Colour- an outfit which prompted a 134% uplift in sales of neon items. In a book released four years ago Kelly revealed that she sketches at least four different designs for a particular piece of fabric and that a fan is used to test how material will move in the breeze before the final creation is decided upon.